Are young people abandoning Labour? November 23, 2018, 11:47 a.m. While Labour supposedly enjoyed an upswell of support from young people at the 2017 general election – the so-called ‘youthquake’ – new YouGov data can reveal that it’s among this group that Labour has lost most support this year. Voting intention for Labour has fallen five percentage points among all Britons since January, from 34% to 29% (although we should note that these figures, taken from the whole population, include those who tell us that they don’t intend to vote, or are unlikely to – hence why the figures are lower than our normal headline figures). This trend is even more pronounced among young people, who are a key pillar of the party’s support. At the beginning of the year the majority of young people (56%) said they would vote Labour. Now the party is holding onto just 44% of the 18-24 year old vote - a decline of 12 percentage points. The Conservatives do not seem to be the beneficiaries of this shift, however. Part of the movement is towards ‘don’t know’ or ‘will not vote’, while smaller parties also pick up a few percentage points here or there at Labour’s expense. Overall, the Conservatives have remained steady among the whole population, holding just over 30% share, and around 17% of the 18-24 year old vote. Support for Jeremy Corbyn himself has also dropped in 2018. At the beginning of the year three in ten people (31%) said they thought Corbyn would make a better Prime Minister than Theresa May. This has since decreased to just a quarter of all adults (23%). Consequently, although the proportion of people who rate May more highly for the PM role has remained constant, her modest five-point lead in January had now increased to 13 points. This decrease in support for Corbyn is, just as with Labour overall, more notable among young people. In January around half (51%) of 18-24 year olds said they would rather see the Labour leader in Number 10. However, our latest data shows that only 35% of 18-24 year olds still say the same - a decline of 16 percentage points. 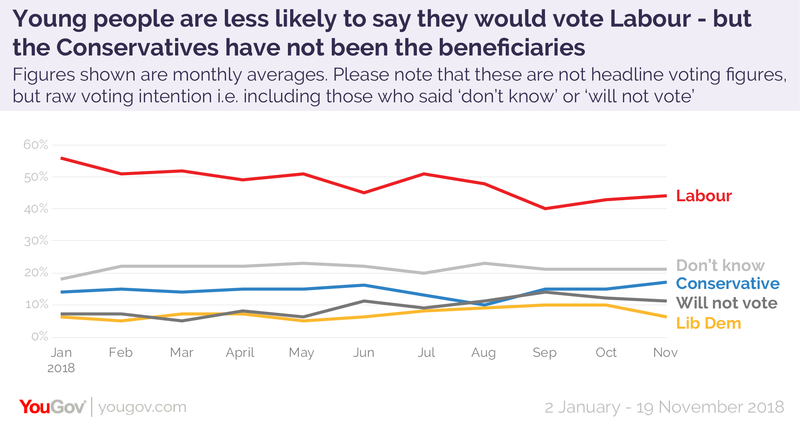 Again, this does not necessarily constitute good news for the Conservatives, as almost none of these young Corbyn ‘deserters’ have switched to May. As with the population as a whole, the proportion of young people who say Theresa May is a better option for Prime Minister has held roughly constant throughout the year, at just below 20%. 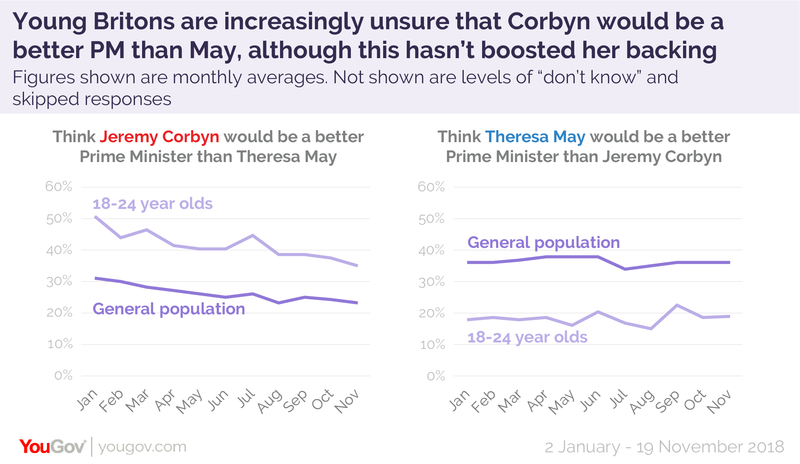 Considering that Corbyn’s main competitor doesn’t seem to be benefitting from his loss in youth support, these results may be less troubling for him than they first appear. Outside of election campaigns, pollsters typically find that many respondents are unsure about how they would vote or their opinion of party leaders, so the move away from Corbyn could be temporary. There’s no reason to presume that these potential voters are totally lost to Labour and wouldn’t return when faced with another election.